Wigan Council conducted the second round of statutory consultation on Standish Neighbourhood Plan. You can read the Final Draft Plan and submissions on it on the Council’s dedicated web pages. You can access this by clicking on the link here. Standish Neighbourhood Plan is a comprehensive document designed to influence the village’s development until 2030. If it is adopted it will give our community a real say in changes across Standish. This is the first non-business Neighbourhood Plan in the whole of Greater Manchester to reach this stage and Standish Voice would like to thank the community for its help in achieving this. In autumn, 2017, Standish Voice conducted a six-week consultation on the original draft plan – called Regulation 14 consultation – and 210 responses were received. Standish Voice would like to thank all those who responded. All these submissions, observations and suggestions from Wigan Council and others were considered ahead of producing the Final Draft Plan. The original draft plan was changed after this consultation to create the Final Draft Plan. This Final Draft Plan was supported by a vote of members of Standish Voice at an EGM in May, 2018. Further suggestions on wording and organisation of policies were given after an independent Examination ‘Health Check’, primarily carried out to see if the Final Draft Plan complied with national planning policy basic conditions. Further changes linked to these suggestions were carried out on the Final Draft Plan and its Evidence Base and appendices ahead of the next stage of consultation. In late October, 2018, the Final Draft Plan was submitted to Wigan Council for the next stage of the Neighbourhood Planning process. After all the necessary documentation was gathered, the Final Draft Plan was published for Wigan Council’s own Regulation 16 consultation on November 7. This was carried out for six weeks until December 19. The Plan, its documentation and the consultation submissions is being studied by a planning examiner ahead of possible changes. The process is then to put the Final Plan to a referendum of people in Standish. If it is passed it will be adopted by Wigan Council. Neighbourhood Plans have legal weight and must be taken into consideration when bodies such as Wigan Council make planning decisions. We hope some of the proposals will also be used when Wigan Council decides how to spend developer and government funds which are expected to come to Standish due to the large number of homes that are being built across the village. As part of the Neighbourhood Planning process, Standish Voice consulted widely with local people at all stages ahead of the Final Draft Plan’s preparation. 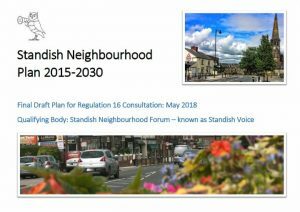 Standish Voice has compiled a Consultation Statement setting out all the consultation undertaken in the process of creating the Neighbourhood Plan and the findings. This includes all the submissions to the consultation on the original draft plan and a table showing Standish Voice’s responses to the issues raised in those submissions. Standish Voice has prepared a comprehensive Evidence Base, which includes maps and appendices, linked to the policies in the Neighbourhood Plan. You can read the Evidence Base here. You can also read its appendices. Appendix A and B can be read here. The other appendices can be read here. You can read how the Final Draft Plan complies with basic planning conditions here. Technical Facilitation – Housing Evidence And Policy was a study to find the reasons behind the high housing growth in Standish. Read the report here. Housing Needs Assessment was a study into what housing is needed in Standish and if it is being delivered by house builders. Read the report here. Standish Village Masterplan was a report that showed how Aecom believes Standish village centre could be improved. We have used some of the ideas within the Masterplan to create policies in the draft Neighbourhood Plan but have discounted others. The Masterplan is only a starting point in how to make the centre of Standish better. Read the report here. You can read the original draft plan, which was was consulted upon for Regulation 14 consultation, here. You can read the updated draft plan, which was changed after the Regulation 14 consultation here but before the Health Check changes here. You can read how policy numbering has changed between the original draft plan and the final draft plan here.